Also: Empyrial Plate and Arm with AEther ? There's a couple more flicker effects that I don't see in your main or sideboard like Nephalia Smuggler / Displace / Illusionist's Stratagem / Deadeye Navigator and weird ones like Baral's Expertise and Supplant Form . And creatures that counter spells work well with blink like Frilled Mystic / Mystic Snake / Draining Whelk . There's also Everflowing Chalice / Astral Cornucopia that work with Pir, and Thrummingbird / Skyship Plunderer that are basically magpies (with Toothy) and help the counter themes. Tel-Jilad Stylus / Crystal Shard / Lord of the Unreal helps with protecting Toothy. What do you think about Whirlpool Drake / Whirlpool Rider / Forgotten Creation / Teferi's Puzzle Box as an additional Alhammarret's Archive? Turbulent Dreams is a nice additional Cyclonic Rift. 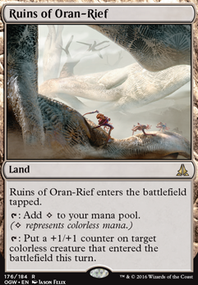 And why do you run no planeswalkers like Kiora, the Crashing Wave / Nissa, Vital Force / Garruk, Primal Hunter (they enter the battlefield and activate with an additional counter with Pir. What do you think of Empyrial Plate / Thassa, God of the Sea / Words of Wilding / Sphinx's Tutelage / Psychic Corrosion / Key to the City as an extra wincon? I have my own deck (here)[http://tappedout.net/mtg-decks/22-07-18-pirtoothy/?cat=type&sort=cost] and I'm considering if these are suboptimal. There's a couple more flicker effects that I don't see in your main or sideboard like Nephalia Smuggler / Displace / Illusionist's Stratagem / Deadeye Navigator and weird ones like Baral's Expertise and Supplant Form . 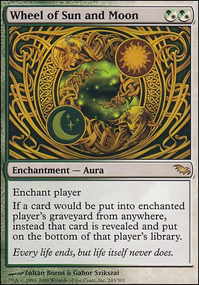 There's also Everflowing Chalice / Astral Cornucopia that work with Pir, and Thrummingbird / Skyship Plunderer that are basically magpies (with Toothy) and help the counter themes. Tel-Jilad Stylus / Crystal Shard / Lord of the Unreal helps with protecting Toothy. What do you think about Whirlpool Drake / Whirlpool Rider / Forgotten Creation / Teferi's Puzzle Box as an additional Alhammarret's Archive? Turbulent Dreams is a nice additional Cyclonic Rift. 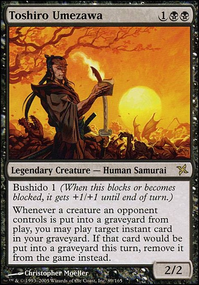 And why do you run no planeswalkers like Kiora, the Crashing Wave / Nissa, Vital Force / Garruk, Primal Hunter that enter the battlefield and activate with an additional counter with Pir? Very fun looking tribal! What kind of direction did you want to go as far as finishing goes? 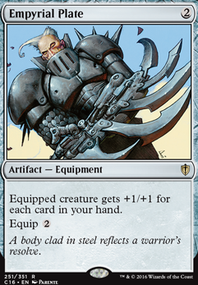 If you want to boost your cephalids, Stoneforge Masterwork and Empyrial Plate might help. If you want some more milling options, Trepanation Blade and Traumatize would work well (particularly when used in tandem with Grafdigger's Cage, as long as it hurts them more than you of course). In general, I have always found a simple High Tide to really help in mono blue to get your late-game mojo out faster. Or can you attach equipment to her in response of her etb trigger? I don't know, I could be wrong. If you only plan to play 1v1, there's a lot of mean cards you can run: Time Stop, Turnabout, Mana Short, Platinum Emperion, Platinum Angel, Propaganda, Isochron Scepter. I also suggest you to reconsider some of these cards: Rhystic Study (in 1v1, it can be underwhelming), Overflowing Insight and Mulldrifter (straight up draw spell, good or bad, always have their limits) and Sphinx of Magosi (its just a really basic cards, you can easily find a better engine alternative card somewhere out there. On another note, if you play with commander damage, I suggest you invest into more voltron-ish play, more equipment and stuff. Otherwise? you should take out Blackblade Reforged and Empyrial Plate (equipment that gives stat boost and no other abilities are fine, but commander's not about the fine, its about the awesome, amirite???). Swiftfoot Boots would be a solid option to consider, or other methods of granting Hexproof. Please note, Shroud is going to be problematic--Scavenge is a targeted ability, so you would not be able to increase Varolz's power if granted Shroud. Indestructible is another good option. That's not really Black/Green's strong-suit, so Darksteel Plate is probably your best option. Double strike is fantastic, which you already have. Flying is quite a good option. Lifelink is pretty strong. Whip of Erebos is a good option, as you can grab a creature from your graveyard for a last hurrah. Bear Umbra is a pretty neat little card, providing a power bonus and the ability to cast cards in both main phases. Empyrial Plate is incredibly mediocre, particularly later in the game. Mikaeus, the Unhallowed seems like a solid option for your commander, as you can sacrifice to regenerate your commander and end up getting a +1/+1 counter out of the deal. If you're running Mikaeus, there's no reason not to have Triskelion as an infinite combo/backup win condition, as it only takes up an extra card. Needle Specter - not really a great card. It's a 1/1 for three mana that requires investment to start being more useful. Llanowar Mentor doesn't do much for you--it takes two turns before the ramp takes effect. While being able to discard a card can help you, there's better options (Liliana of the Veil comes to mind).